Our Yoga Alliance accredited Teacher Training Immersions, are results driven with carefully mapped out curriculum to support each individuals specific level and needs. In a supportive environment physical and spiritual dimensions of Yoga are taught in an accessible format. Yogas vast and timeless philosophical teachings are a focus on the programme and If presented optimally this ancient knowledge can be as inspiring as it is life changing providing fresh perspective to enhance the life experience. Your foundation practice each morning is Vinyasa level 1 / 2 suitable for all levels due to individualised attention . Variations and preparatory postures will be shown as well as the full expression of the postures so that each practicioner has a framework to practice optimally within. Handstand transitions throughout the sequence are also taught and are optional. There is a 1.5hr handstand / arm balance /conditioning workshop daily as well as a 1.5 hr adjustment and alignment class both to support safe and optimum progress. Methodology consists of learning practical hands on adjustments of asana and developing your empowered voice as a teacher and guide. You will have the opportunity to teach daily and develop your own creative sequence. You will learn how to create freedom in your breathe to access and remove tension, and how the correlation between alignment and ability to breath optimally are essential in yogic practice. Meditation is taught with a focus on breath awareness during the physical practice to make each yoga class a moving meditation. This helps prepare the mind and body for seated meditation and pranayama. You will also be introduced to Mantra meditation and how to incorporate these into classes. We understand that in one group there can be many varying levels of practcioners and we run by the motto that knowone is 'better or worse' than anyone else. We have all just placed different ammount of time and energy into different things. As previously mentioned each individual is given their own variations and access points to each asana for optimum progress in a supportive, uplifting and fun environment. Check out our teachers bios. Our 200 hr programmes are results driven with a focus on mindful movement mastery, optimum alignment and breath, with a unique inversion focus and revolutionary teachings in yogic philosophy. Yoga as therapy (benefits/contraindications and therapeutic use of asanas). Strengthening the mind and will to accomodate the challenges of life. Svarga Loka translates to heavenly kingdom and this resort couldn't ring more true to its name. Abundant in nature, nestled on the banks of the famous chamhpuan river where you can enjoy fine dining, luxurious river side flower baths, massage, sauna, and more. Svarga Loka resort is awaiting you with open arms. The origin of this resorts name takes inspiration from the Hindu epic poem, the Mahabharata, which describes Svarga Loka, as Good Kingdom – a heavenly paradise for the Hindu Gods. A humble recreation is evident here, and Svarga Loka sits on the riverbanks of the beautiful Campuhan river in Ubud, Bali. 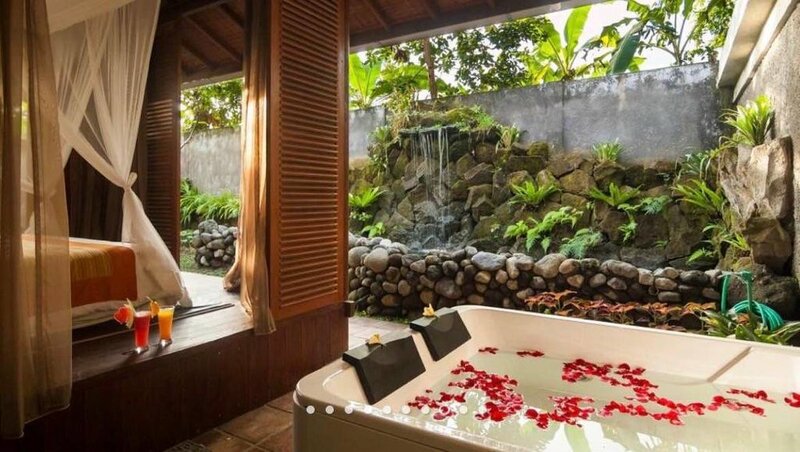 The resort offers a wide range of luxury accommodation and facilities as well as boasts two wellness centres offering treatments such as massage, Balinese healing sessions, colonics, mineral infusions as well as use of the sauna, and swimming pools. These treatments are very complimentary to your yoga journey, supportive to the overall wellness experience. The resort also has beautiful stone baths on the famous champhuan river that can be filled with mineral water, therapeutic aromatherpy oils and flowers upon request. Close by is the famous water temple and many stunning waterfalls. 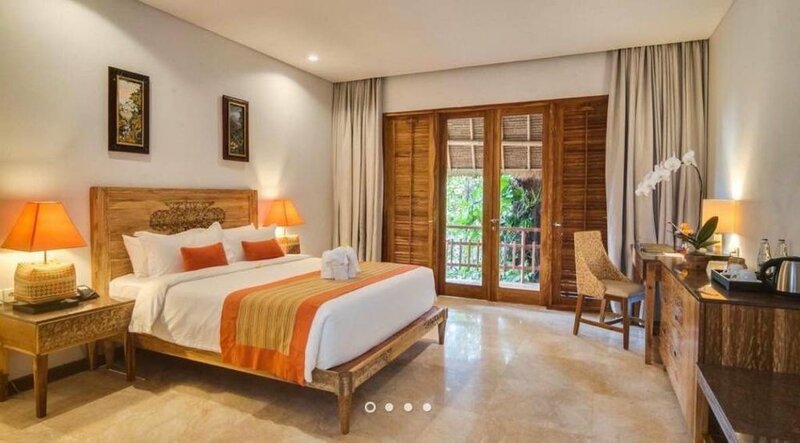 The exquisite nature, traditional balinese markets allowing you to explore local culture as well as a huge array of upmarket boutique bohemian shops, abundant cafes and like minded people make this an experience to remember! Ubud also hosts an array of local and international cuisine nearby the resort, and Svarga Loka itself offers incredible meal options! The origin of this resorts name takes inspiration from the Hindu epic poem, the Mahabharata, which describes Svarga Loka, as Good Kingdom – a heavenly paradise for the Hindu Gods. A humble recreation is evident here, and Svarga Loka sits on the riverbanks of the beautiful Campuhan river in Ubud, Bali. 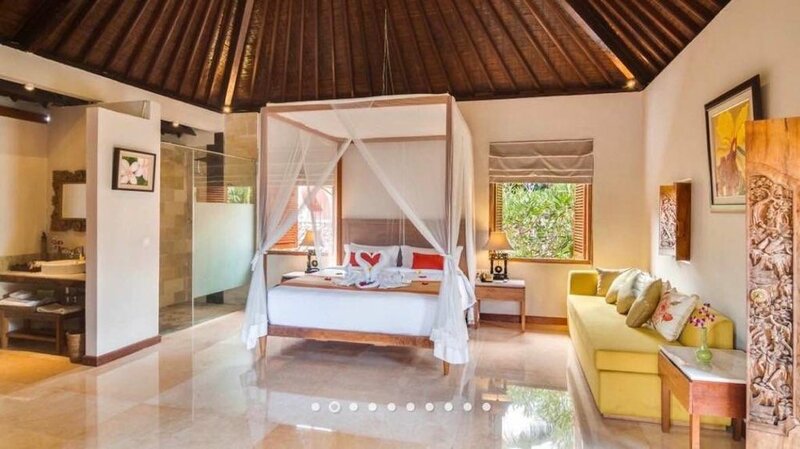 The resort offers a wide range of luxury accommodation and facilities as well as boasts two wellness centres offering treatments such as massage, Balinese healing sessions, colonics, mineral infusions as well as complimentary use of the sauna, and swimming pools. These treatments are very complimentary to your yoga journey supporting the overall wellness experience. 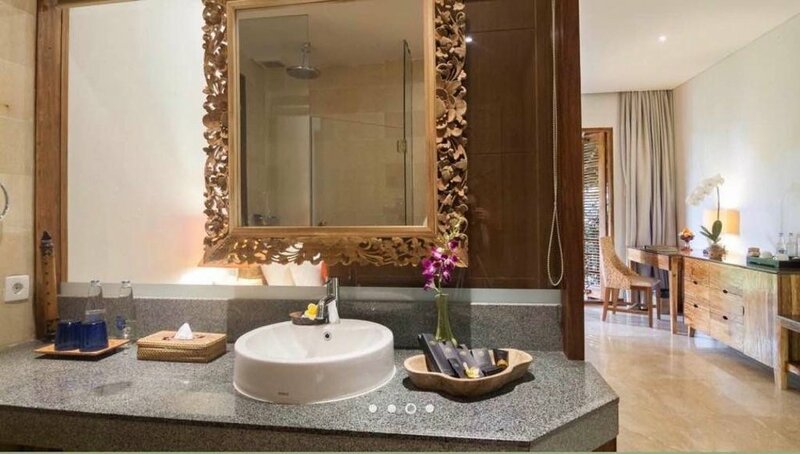 The resort also has beautiful stone baths on the famous champhuan river that can be filled with mineral water, therapeutic aromatherpy oils and flowers upon request. Close by is the famous water temple and many stunning waterfalls. The exquisite nature, traditional balinese markets allowing you to explore local culture as well as a huge array of upmarket boutique bohemian shops, abundant cafes and like minded people make this an experience to remember!